one happy little crafter: a bit of simple furriness! Hello there, hope your week has got off to a good start! Managed to squeeze a bit of crafting time in last night, and seeing as I'd really enjoyed making the Owl card in my previous post, I decided to keep with the CAS. I'd also spotted that the current theme at Less is More is "this makes you happy", so the choice of image for this card was a proper no-brainer. I chose Mac from DSB as he looks soooo much like my gorgeous westie Nippy......and that little four legged bundle of fluff and mischief makes me happy every day. When you get home from work, every day he is delighted to greet you and I've spilt many a cup of tea because he had decided that its time for a cuddle and he'll settle down beside you and nudges his nose under your elbow! Awww such a gorgeous card,adorable image and wonderful design. I can totally understand why your Nippy makes you so happy, he sounds so lovely. This is a real sweetie Lisa, what a lovely image! 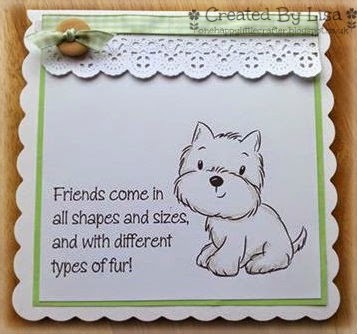 I like the stamp of the westie and love the tekst you have used! Sorry for my late visit Lisa, what a fab and cute card for our happy challenge! Beautiful card, I love the sentiment and the image is just so cute...Thank you for sharing with us at 'Papertake Weekly'.. good luck..
Beautiful card, thank you for joining us at AGOAC. Good Luck!